Once again the members of South West Quilters have exhibited a superb show at the Spring Exhibition at Westpoint. 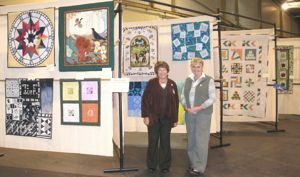 Approximately 84 quilts were hung and the comments from visitors to the show proved conclusively what a high standard they all were. The quilts were well hung and easy to see. Emma Cooling from Grosvenor had asked if they could select 30 quilts to take on tour until November; they will be exhibited in Cambridge, Edinburgh and Harrogate. Actually 41 quilts were selected and 3 members who had not offered their quilts for touring were persuaded to let them go as they were so beautiful. Well done especially to Joan Dawson, Ngaire Yvonne Lang and Mandy Lovick, your quilts can now be appreciated by the wider public. Thanks must be given to the 5 ladies who, with much persuasion, agreed to be judges for the In Stitches exhibition. Thanks, then, to Sarah O’Hora, Jane Hopkins, a friend of Maggie Davies [who was unable to judge personally as her eyes were bad], Jan Whitehead and Carol Rowland. The winners were:- Gaynor Webb for the quilting on Noriko, Sheila Fraser-Cleary for Innovation with her piece Labyrinth in Seaton, Bev Marjoram for her Traditional [and first] quilt Lilac Dreams, Jeanne Stetson for Applique on Eastern Promise and Pat Dolbear for her use of Colour in Midnight Orchids. Many congratulations to you all. Each judge was also asked to select any quilt of their own choice and these were:- Ngaire Yvonne Lang for Come Humming with Me, Val Thomas for Sisters, Kathleen Hughes for Poppy Wreath, Joan Dawson for Neopolitan and Caroline Edginton for Sashiko Wallhanging. Many congratulations to these well deserved winners. The challenge of Time to Quilt was a smaller part of our exhibition but, as they say ‘small is beautiful, and this was no exception. The winner was Kathleen Lewin with Roman Times, second was Jean Bartlett with Midnight and third was Vineta Cable with The Dye is Cast. Well done to you all, some fantastic interpretations of the title and some wonderful skills. Our stand and sales table raised £166 and it has been suggested that this goes towards a new sound system for SWQ. We currently borrow the Quilters Guild system and have been lucky so far that it has always been available. This will be on the agenda for the committee. My thanks, especially, to all the willing helpers during the 3 days. It was tiring, but the cheerfulness of everyone and the many, many appreciative comments made it all worthwhile. Lots of visitors wanted membership forms and some even completed them at once. If all 50+ ladies join us we shall indeed have done well. The whole exhibition was, in many people’s view, the best ever at Westpoint, with more quilts on display and a very friendly and relaxed atmosphere, plus lots of opportunities to buy goodies. We are indeed lucky to have had such a good facility on our doorstep. What of the future? If we want to keep a local South West exhibition we must support it, not only by simply visiting, but by allowing Grosvenor to show off the many talented quilters we have. The location of the next SWQ exhibition in 3 years time will be the decision of the 2010 committee. In the meantime if your group has a local exhibition please consider offering it to Grosvenor for next March or offer your Challenges, we read about them in the newsletter but very few members get to see them. Stop hiding your lights under bushels and show off your skills and talents, and let someone else do it for you. Thanks to everyone who entered a quilt, who helped in any way and to all the lovely visitors, it was nice that so many members came to say Hello and tell us what they thought. 3 good days which have helped to put South West Quilters firmly on the map! Now let’s keep it up!